Image: the Blue Grotto 200m from the Grotte Zinzulusa, Apulia, Italy. 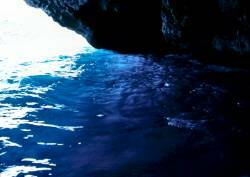 There are many Blue Grottoes in the world, all of them are sea caves. Or more exact: caves partly filled with sea water with an entrance at or below sea level. The reason for the name is always the same: the partly waterfilled cave has a conection to the sea. Sunlight entering the cave through the water gives the cave a mystic blue shine as the water filters the light and lets only the blueish components into the cave. The light shows all shades from emerald green to turquoise blue. Most blue grottos are entered by boat. Sometimes you have to swimm or dive to enter the cave. The Grotta Smeralda has a natural entrance deep below sea level, and is entered throug an artificial entrance. Grotta dello Smeraldo, Capri, Italy. Green instead of blue, but more or less the same. Γαλαζια Σπιλια (Galázia Spiliá), Kastellórizo, Greece. Γαλαζια Σπιλια (Galázia Spiliá), Skiathos, Greece. Γαλαζια Σπιλια (Galázia Spiliá), Zakynthos, Greece.